This article was originally published in Hus Forbi and on the INSP News Service. 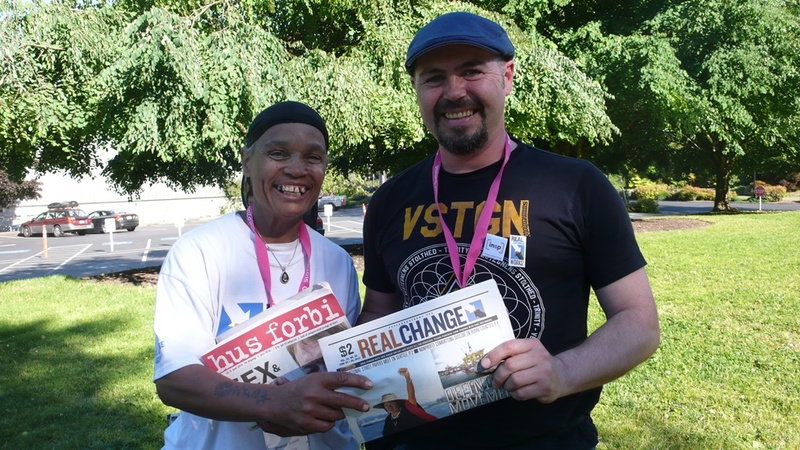 During the INSP Global Street Paper Summit 2015 in Seattle, Henrik Søndergaard Pedersen (below right), who sells Hus Forbi in Copenhagen, met Sharon Jones (below left), a vendor for Seattle street paper Real Change to discuss the challenges and rewards of selling street papers. Sharon Jones is a small woman but she looks strong. Her smile is so warm and welcoming that you immediately understand that this is a woman who can sell a lot of papers and be a good ambassador for Real Change, the local street paper in Seattle, Washington in Northwest America. Real Change were the co-hosts of the INSP Global Street Paper Summit 2015. The Danish street paper Hus Forbi is an INSP member and I participated in the event as one of Hus Forbi’s board members. This was how I met Sharon. In Denmark you can be a Hus Forbi vendor if you are homeless, formerly homeless or socially vulnerable. I guess Sharon belongs to the last category. Like me, she has an apartment but she lives her life in the streets and among the homeless in Seattle, where the housing problem is enormous. Everywhere in the parks and on little green spots surrounded by the busy traffic, the homeless have pitched their tents. There is even a well-organised tent city for homeless people in the outskirts of town. Sharon often approaches people in the tents. 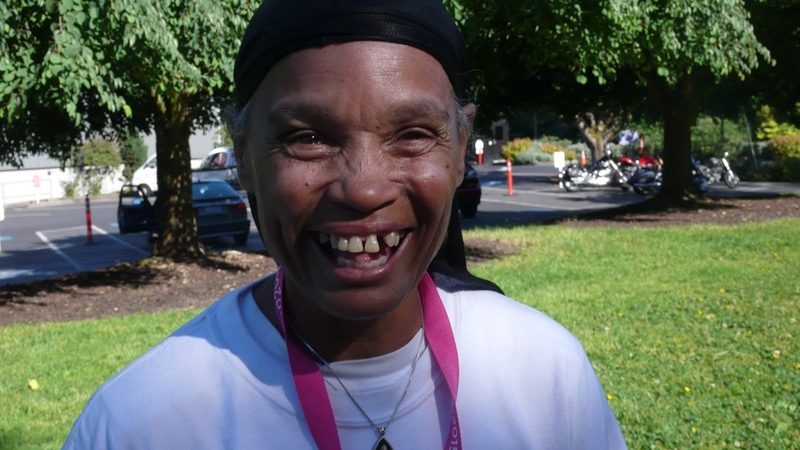 Sharon has been a Real Change vendor since 2004. She is now in the street paper’s Top 600 club, which recognises vendors who sell more than 600 copies. “I could not get a job and a friend told me: ‘You can sell Real Change!’ It cost one dollar at that time, I said: ‘I want a job, I don’t want to stand out in the rain and snow selling a one dollar paper.’ I went there anyway and whatever I have in my hands, I sell it. Anywhere I go, I sell the paper,” she says. “Is there no restriction?” I ask. In Denmark we can only sell up to 175 papers a week because, being a vendor, you are supposed to get a welfare check and only sell as an additional income-generating activity. Sharon replies that Real Change vendors can go out with as many papers as possible. I go on to ask Sharon if she receives a good response from people when she is out selling. In Denmark we sometimes have problems with supermarkets that do not want us in front of their entrance. “The majority is nice. Even though they just walk away. I say: ‘Good morning.’ They may not want to speak, but I have already spoken. With others I talk about everything. I don’t miss a bean,” Sharon says. “You must be a strong woman. Not only do you sell 600 magazines – Real Change is a weekly while Hus Forbi is published only once a month – you also work hours cleaning,” I say. “I get no welfare check. I am cleaning offices at the Pike Market. There are also some weaker senior citizens who give jobs cleaning, and I clean at Buffalo Wild Wings [a local restaurant]. But Real Change is like my real job,” she answers. When I first met Sharon the day before the interview, she was wearing a football jersey. Now I wear my favourite soccer teams’ jersey – and she wears a Real Change T-shirt. “Now, I’m more interested in [American] football than in soccer. I meet the Seahawks fans at the Top Pot Donuts. They see my jersey and they say: ‘Go Hawks!’ It started when the Seahawks got to that Super Bowl. We talk sports and we talk anything else,” Sharon says. We are both participants in the INSP Summit and it is time to go to the next event. We exchange papers and as we start walking towards the auditorium at the Seattle University, another vendor comes to say ‘hello’ to Sharon. “Take off my shoes,” he answers. As told to Poul Struve Nielsen.